A few weeks ago I was approached by Common Creative Atlanta’s Maria Pinkleton. She had a few questions for me regarding my art. I think they did a great job with the article and I appreciate them asking me to set them straight on the facts! You can read my little interview here. 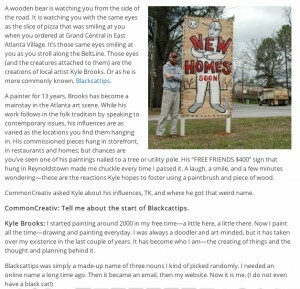 This entry was posted in interview and tagged art, atlanta, blackcattips, common creative, common creative atlanta, folk, interview, kyle brooks, maria pinkleton, street art. Bookmark the permalink.